To anyone who purchases a copy of my book Flower Spirit Medicine I am offering a free, personalized astrological Flower Essence & Gemstone report emailed to you, along with a mini-consultation. That is, one question answered with a flower essence suggestion. This offer is valid now throughout September. With Mercury squaring Mars this weekend and Uranus preparing to enter Taurus on the 15th, I thought this info might be useful to revisit. Walnut flower essence is one of the most useful supports for the experience of tremendous change, both inner and outer. Change is what’s occurring now and will be occurring quite a bit for the rest of 2018, with Uranus ushering us into all kinds of uncanny, unique or unexpected territories. What do I mean by change? The word has almost become cliché in some ways so let me clarify. I mean change as in ABOUT-FACE CHANGE, RADICAL SHIFT change, some RATHER SUDDEN TURN OF EVENTS that blow minds and leave people scratching their heads in wonderment kinds of change. Just saying. The fun has just begun! Mercury is in the late degrees of Aries along with Uranus, and both are being squared by Mars in Capricorn, which will be moving into Aquarius on the 16th. And…”edgy” would be an understatement about the energy of the times. Creative sparks are flying and this could bring just the opportunity or at least the inspiration that you’ve been waiting for to break out of some old rut or try something new. Greetings all you lovely beings out there who are reading this! Here we are at another turning point and Equinox in the year. In the Northern Hemisphere the Spring officially begins on March 20th. This is a special time for review, preparation, and many intense transitions. This is meant as a fun post, as well as a request with an offer tied to it. I am offering a 30% discount for a 1 hour reading for the 3 best testimonials (by anyone who has ever had a reading/readings from me) between now and May 1st. The sender of my top favorite testimonial will receive additional gifts of a beeswax Tulip candle (hand-made by me), a surprise crystal, and a custom blend mist that includes flower essences and essential oils. Any other testimonials may be included on this site or elsewhere, unless you say otherwise. These testimonials could be written or in the form of a short video (video would certainly be a huge plus! ), or some other creative method you may come up with. I really appreciate you all. Wishing you a fantastic new season, wherever you live in the world. Starting with the obvious, whether people believe in the astrological aspect or not eclipses are triggers for tremendous stress and change, both personal and global. They can be ominous or inspiring. Will something bad happen? Yes, of course it’s already happening. I don’t care to elaborate, partly because there is enough of it to go around on the web. You might also be noticing great shifts occurring in your physical bodies in relation to the Earth. How many of us rest and move in our bodies is changing very rapidly and radically, in part due to the changes occurring on this planet. There are influences within our planet’s sub-structures and off-planet objects influencing these changes. The Solar Eclipse is in the late degrees of Leo. This can inspire us to bring out our best, boldest self and share our gifts with the world. It poses the question, to who or what does one give or receive authority – and what impact does this make? Do you bow down? Do you demand an audience or naturally gain one through charisma? Do you give extra power to political clowns and blame everything wrong that happens in the world on them? The polarity of Leo & Aquarius – do you ever acknowledge the sources of your inspiration, that from which you came from (stars and sky) those who have come before you, those who gave you the tools or assistance to carry on or better yourself? Some people love to credit their family, friends, lovers, teachers and benefactors where due, and others prefer to claim all credit – never acknowledging who encouraged them or gave them the ideas and means to achieve something. Conversely, most of us place blame on others hands down. Not many of us choose to take responsibility for our mistakes and how they contributed to something awful. Leo’s opposite sign, Aquarius – in what way and to what or who do you see yourself as being connected? We are all different expressions of life but in the “big picture”, we are also connected. It’s interesting to see all of the different facets that make the whole of the human race, not to mention the animal and plant kingdoms. In a worst-case emergency situation on planet Earth, do you think that anyone’s personal beliefs and political views would even matter? Sometimes, when things seem really out-of-control this thought helps put things in perspective. How does one actually survive and relate not only to other humans in this world to but the Earth itself? How one relates to the Earth will color and shape the rest of one’s life and relationships. Is the relationship contractive or expansive? 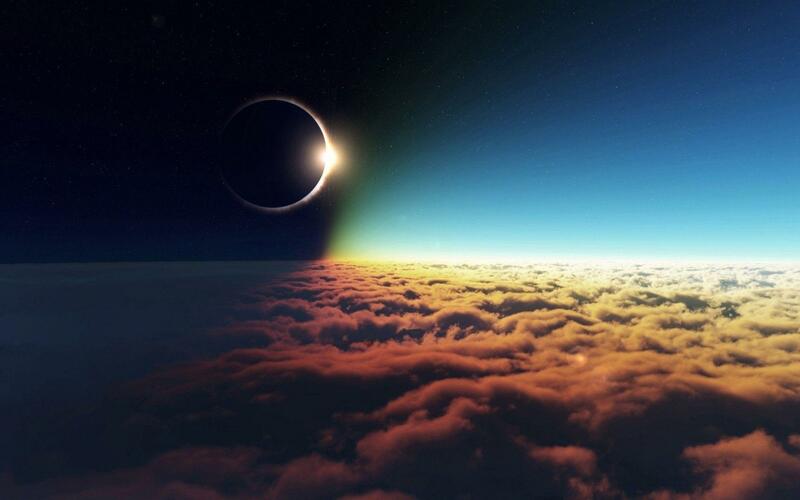 An eclipse brings massive change. Some resist it, others dive in. The symbolic energy of an eclipse may be likened to a combination of the Tarot cards The Hanged Man and The Tower. One is, or many are forced to surrender and can’t know exactly what will happen next. “The only thing certain is that nothing is certain” – to quote whoever came up with this. Things are falling down, coming undone at full speed. Whether this is beneficial or harmful depends on a lot of other factors. There is some degree of choice involved, which begins with an angle of perception. Are decisions made from fear or love? Sometimes, it can be far more potent and adventurous to be propelled by questions rather than to assume the answers.